A letter of indignation: You (or ‘we’, maybe; it changes) are missing the point even though she’s making it so, so difficult for you to do so. You’re picking and choosing -- taking words out of the box they came in and wearing them around your neck as if the meaning is yours to shape. This letter is anger wrapped in wit and charisma. A palatable castigation of a pervasive injustice that wears a stubbled face, condescending smile. So far, so familiar. Beware of the Dogs is the logical progression of 2017’s Thrush Metal – an EP that gutted social issues of their politics and left the sinew and blood of a beating heart exposed to the audience. The audience, Stella thought, would be diminutive, a few tapes distributed to friends and family. But her delicate fingerpicking and shimmering vibrato carried her across state lines, oceans, into record deals and mixing rooms. The juxtaposition is apt: Beware of the Dogs is Stella adjusting the scales, shifting seamlessly between intimate and all-encompassing. Just so, the title track addresses political chauvinism and then pivots into U Owe Me -- a daintily fingerpicked campfire singalong about a boss neglecting to pay his bar staff (“he actually paid me like a week later, I was just looking at the wrong payslip”). She digresses, undercuts important conflicts not to belittle them but to ingratiate herself with the demographic that needs to listen the most. Anyway, that transition from the panoptic title track to the definitively personal, arguably petty U Owe Me seems to imply that the imbalances of power Donnelly sings about are, above all else, systemic. Beware of the Dogs is a timely reminder of how deeply ingrained certain toxic dynamics are, how every condescending riposte, every failure to admonish misogynistic behaviour within your own circle (even – no, especially those little offhanded remarks) perpetuates and strengthens a social order which disparages the agency of women and other groups that are decidedly Not-Men, Unmale, Whiten’t. And if this reads like the kind of protest your Dad would go to war against, it’s because it’s impossible to discuss Stella’s music without addressing the personal experiences that make up the DNA of her music (i'm sure the decision to release this record on International Women's Day was deliberate). But in the melting pot these experiences go, blending into a passion which belies the effervescence of what, to the inattentive, sounds like a summer album, all impish guitar tones and irreverent one-liners played off with a laugh (“My mum’s still a punk, and you’re still ***”). It’s a masterful little contrast that’s historically absent on debut records; the push and pull of snark and sincerity is what ekes out a space for pathos amidst the inclusion of gliding synths and modest percussion. When the credits roll, the contingency of diametrically opposed tracks like Season’s Greetings and Allergies is the thing that so efficiently conveys Stella’s ability to walk the blurred lines between sadness and anger, bitterness and hope, vulnerability and tenacity. A letter recounting the changing of seasons: we're welcoming a new summer, a new way of playing old songs, and we're taking a leap of faith from the ‘you’ to the ‘we’. At its heart this thing is about relationships of all kinds of significance, how they begin and how they end, and these timelines are outlined and analysed with a world-weariness that holds the potential to turn listeners inward. *We* are convinced to reflect on our own little worlds with this album, which is a gift not many records can claim to possess, and Stella is the perfect host for this little party of self-examination (awareness" castigation" improvement"). The warning signs over there are painted in bright, happy colours. Make sure you read them carefully. "the songs are good too"
Yeah, very intelligent writing as always! I’m struggling trying to decide who to compare this to honestly. The lyrics are definitely more abrasive and musically it borders on art pop at times. The Australian Jenny Hval? 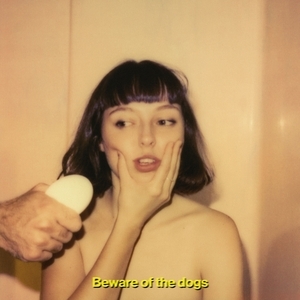 "Beware of the Dogs is a timely reminder of how deeply ingrained certain toxic dynamics are, how every condescending riposte, every failure to admonish misogynistic behaviour within your own circle (even – no, especially those microaggressions) perpetuates and strengthens a social order which disparages the agency of women and other groups that are decidedly Not-Men, Unmale, Whiten’t." You came here to read a review and you get propaganda from another brainwashed poor soul. "You came here to read a review and you get propaganda from another brainwashed poor soul." If the album is even half as well written as this review it's worth a listen. the instrumentation here rules, well done job. Not 100% sold on her voice, tho, i can't put my finger on it, but there's something off there that takes me out of it. "(even – no, especially those microaggressions)"
you know, the review was going well enough, and then you had to unironically use the word "microaggressions". lol.